What is the Court Management Program (CMP)? The Texas Court Management Program (Texas CMP) certification mirrors the nationally recognized program developed by the Institute for Court Management (ICM) and will be offered in Texas exclusively to Texas court personnel. Who are the program's sponsors? 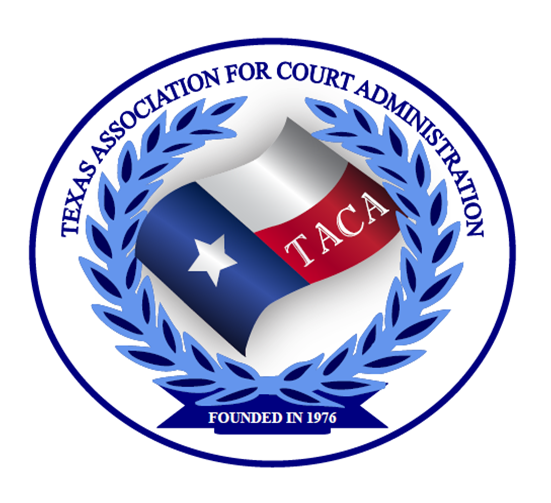 TACA, in partnership with the Texas Center for the Judiciary and the Institute for Court Management of the National Center for State Courts (NCSC). Who can attend the Court Management Program? Texas CMP is designed for those persons who have completed the Trial Court Coordination and Trial Court Management courses of the Professional Development Program curriculum. Applications will be reviewed before acceptance, and preference will be given to applicants who have already completed these two programs. What if I have not completed PDP or completed PDP long ago? If space is available, applicants who have not completed Years 1 and 2 of PDP will be considered, but these individuals must commit to attend and complete the ICM Fundamental Issues of Caseflow Management course prior to the concluding seminar and at their own expense. A Texas CMP applicant must have completed PDP within the previous 5 years prior to submitting an application in order to waive the required completion of ICM Fundamental Issues of Caseflow Management. What is the program's schedule? The Texas CMP program consists of 5 core courses (2.5 days/16 hours each). The courses begin with the Texas Center for the Judiciary's PDP, continue at TACA’s Annual Education Conference, and conclude at the following Texas Center for the Judiciary's PDP. What are the advantages of attending the class in Texas? The partnerships developed allow the program to be offered at substantial savings (one-third of the cost of completing the program through ICM) to participants through the use of Texas faculty and reduced travel costs for participants. The Texas Center for the Judiciary will reimburse the Texas CMP participants for travel, meals, and lodging for the courses running concurrently with PDP per grant guidelines. Participants and/or their respective counties will be responsible for expenses incurred while attending the courses running concurrently with the TACA Annual Education Conference. Participants will be required to pay the registration fee of each concurrent program (each PDP and TACA Annual Education Conference). The registration fees are not reimbursable by the Texas Center for the Judiciary. If you have any questions, please call the Texas Center for the Judiciary at 1(888)-785-8986 or Ed Wells at (832) 927-6500.